A new book on Erie Street Cemetery by Arcadia Publishing is available under the Images of America Series. John D. Cimperman wrote it in association with the Early Settlers Association of the Western Reserve. Erie Street cemetery is Cleveland's oldest existing cemetery. Today downtown Cleveland towers over this peaceful plot of land, which has remained essentially unchanged since it was opened as a burial ground in 1826, in what was at the time the far edge of the town. Within the cemetery are the graves of soldiers who served in the Indian Wars, the Revolutionary War, the War of 1812, Spanish American War, Civil War, as well as more recent conflicts. You will also find the last resting place of many of the city's early leaders and pioneer families. It is the site where the saga of the life of early Cleveland can be told from its founding as a pioneer settlement, to becoming a boomtown and then on to the industrial revolution. A cemetery cannot speak, but this book unfolds its story. 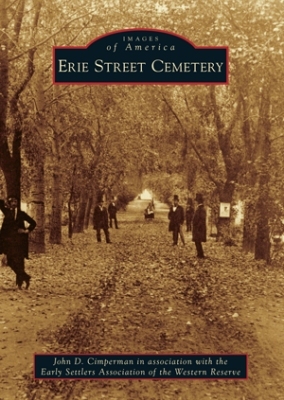 Please send me________ copy(ies) of Erie Street Cemetery book at a cost of $21.50 each ($20.00 reduced cost + 2.50 shipping).